These parts are excellent quality and are manufactured to extremely fine tolerances. The nozzles are pressed copper. 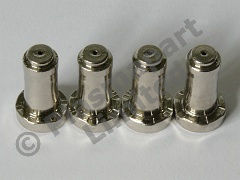 This pack is supplied as shown, and contains 4 nozzles. Model 21008A.